Completely made of plastic, reduces vignetting effect, prevent glare and lens flare caused by unwanted light. Jazz up your photos with richer colors and deeper saturation. Protect your lens from minor impact. 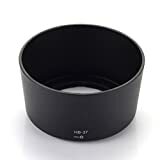 This Bayonet Lens Hood is designed for NIKON DX AF-S MICRO-Nikkor 85mm f/3.5 ED G VR and NIKON DX AF-S 55-200mm f/4-5.6 VR and VR II lens. In addition, since the end of the lens is extended you also get the added benefit of some extra protection from accidental impact. Included: 1 x Lens hood replaced for HB-37. This entry was posted in Discount Photography and tagged 55200mm, 85mm, Bayonet, f/3.5, f45.6, Fotga, HB37, Hood, lens, Lenses, MICRONikkor, Mount, Nikon, Replacement by Ball Photo. Bookmark the permalink.